Danish Bike Messenger on the bike lane in the heart of the city. 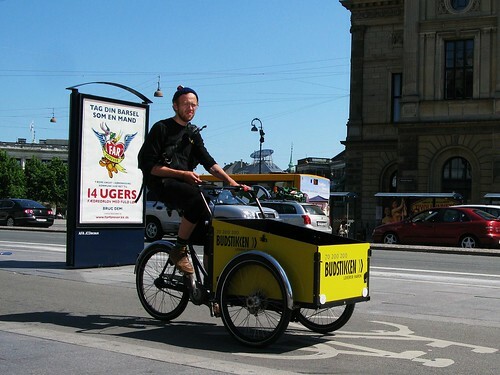 A Christania Bike for larger deliveries from Budstikken. We have posted many photos about how bikes are used as advertisments in the urban landscape. A new Danish company is taking it one step further. 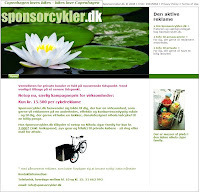 Sponsorcykler.dk - or Sponsor Cycles - is providing an attractive way for companies to advertise in the city. Even better, families can get a new Nihola cargo bike for basically half-price - 7000 kroner - if they sign up and agree to keep the adverts on the cargo box for six months. As we described a few days ago, using your bike for adverts is a given. Your bike is on the bike lanes all day long. Dropping your kids off at school/kindergarten/daycare, then off to work, then to the supermarket and back to get the kids, and so on. You are visible to the traffic - cars and bikes - for long periods of time during each day. Sponsorcykler.dk, the company who is arranging this marriage of convienence between advertisers and families itching for a cargo bike, only accepts ethically-sound products with an environmental angle, which is extra cool. Having a chat as they ride. 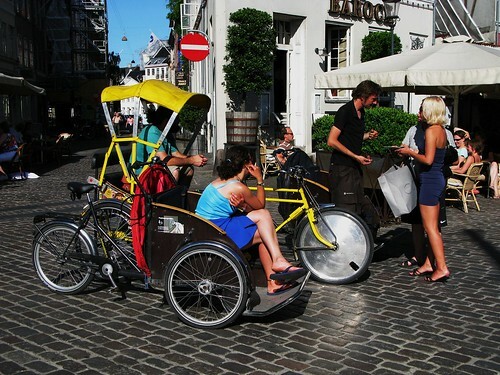 Three rickshaw type bikes in Nyhavn - tourist central - vying for punters.